At least two (more may come to light) variations of the Fireball have been tested over the years. The photo below shows Bill Kempner sailing FB902 single-handed from a sliding seat (International Canoe-style). 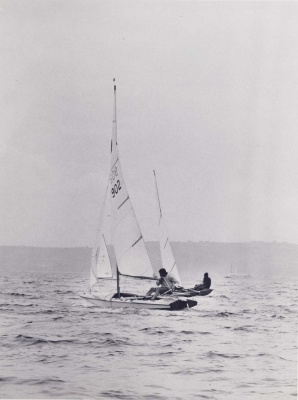 Bill took 'Schizo' to the 1965 IYRU Single-Handed Trials but, in the event, was unsuccessful. Many years later, GBR14483 (the Winder plug) was temporarily converted to an asymmetric rig. It is hoped a photo will be available to be posted soon.